A young orphaned Vietnamese student has successfully entered college after overcoming multiple great difficulties in her early life and education that served to make her more determined and mature. At midnight on a recent day, Nguyen Bao Trang was returning to her room on a bicycle from a part-time job when most other tenants in the rented suite had fallen into slumber. The 18-year-old packed her clothes and books to be ready to move to Ho Chi Minh City for higher education, leaving behind her residential area in Quang Ngai Province, located in the central region, but not her sorrowing past. Trang’s parents had had their own broken families before meeting each other and tying the knot without a marriage certificate. This explains why the child’s birth certificate only showed the names of her biological father and the man’s previous wife. After Trang was born in 2000 in Ho Chi Minh City, her blood parents left her in the care of a neighbor in the metropolis, became itinerant workers and visited her once a month. Six years later with the father dying from a stroke, the mother sent her to an urban orphanage and did not see the daughter until she completed elementary school. Trang’s mother let her stay in the house of the child’s poor paternal aunt in Quang Ngai and paid her occasional visits. Here Trang was sometimes scolded and solaced herself with the thought that she was very fortunate to have an opportunity to be fed and attend middle school. The only time she could sleep with her mother was a night prior to Vietnam’s largest traditional holiday of Tet in 2015. Three days later the mother died, and Trang traveled to her mother's hometown in Quang Ngai to attend the funeral. “That’s the first time I had got to the place where my mom lived. I came to put on a white headband and then returned home,” Trang recalled, mentioning a strip of cloth worn around the head at Vietnamese funeral ceremonies. When Trang nearly finished grade nine, the aunt asked her to stop her formal education in order to learn sewing – a requirement that plunged her into confusion. “I was terribly afraid of quitting school. I had many sleepless nights. I retreated to the back of the house. I really wanted to cry but couldn’t,” the student recollected. Emboldened by the thought, Trang asked for money from her middle school teachers, left the aunt’s house and studied in urban Quang Ngai, where she lodged with a woman she knew in a back-alley rented accommodation. Trang paid the monthly rental and worked her way through grade ten by working at a local coffee shop. As an eleventh grader, she submitted her request that she should be allowed to stay off school for one academic year to be committed to employment because she could not pay the tuition, even though having tried to work during the entire summer vacation. Her form teacher disagreed and asked the school to help the student, leading to her monthly receiving VND500,000 (now $22). So Trang continued to tread her education path while maintaining part-time jobs. She won over VND1 million ($43) every academic year in high school from the provincial tests to select excellent students in a certain subject. One day, upon returning from school, Trang noticed several tattooed men standing in front of her room, which had been turned upside down and whose door was swung open. She was terrified when the men asked her where the woman staying with her was, and later knew that the roommate was fleeing due to indebtedness. The following nights, the student was waken by successive knocks on the door accompanied by shouts requiring the roommate to show up. “That’s the moment I wished somebody had stayed by me and protected me,” Trang recalled. The harassment forced her to move. She said on Lunar New Year Eves, she felt lonely pedaling from work along the street, seeing people gather for celebrations. 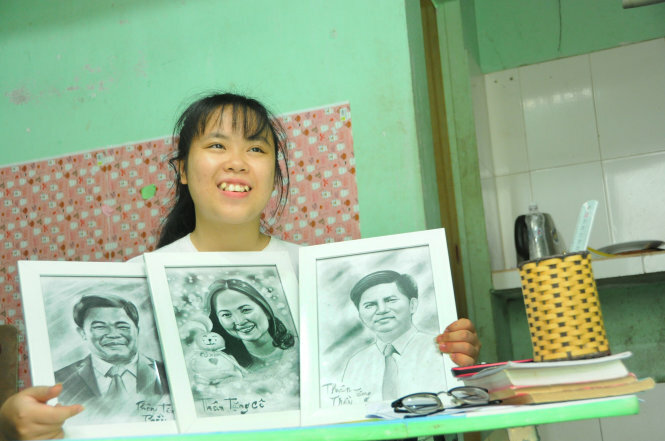 Trang has been admitted to the University of Social Sciences and Humanities, a famous education institution in Ho Chi Minh City, and told Tuoi Tre (Youth) newspaper that she had mapped out the livelihood plan for days to come. “I have to study there,” Trang said. She added she would stay in a school dormitory and find part-time work in the first semester before renting a room in the second one in order to have more jobs. “If I have a motorcycle, I’ll work as a GrabBike driver at night,” she said. “I supposed many times that I wouldn’t be able to overcome problems, but I eventually managed to solve them. The same goes for the coming days. “As I’ve had sad and disappointing experiences, everything now looks calm to me. I can endure any suffering in the future.